Margaret Louise Lobb - Edmonton's Burial & Cremation Professionals | Trinity Funeral Home Ltd.
December 25, 1940 – December 20, 2016. It is with great sadness and much love that we say goodbye to our Mother, Sister, and Aunt who passed away peacefully in Edmonton on December 20, 2016 at the age of 75 years after a long battle with lung disease. She is survived by 3 daughters: Sheryl (Ken) Neufeld, Susan (Leon) Walroth , and Annette (Tom) Neufeld; 9 grandchildren, 5 great-grandchildren, brother Wayne (Sandy) McElroy , nieces: Kim (John), Sandy (Rob), Yvonne (Tony) and nephew Steven (Tammy), along with several great nieces & nephews. The family wishes to thank all the staff at Extendicare Eaux Claires for all the great care she received. 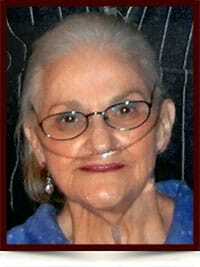 A Graveside Service for Margaret will be held at Alto Rest Cemetery at a later date.